A small flock of singing White-winged Crossbills was reported from Sullivan County, New York in the middle of August, in the same locale as the Pine Grosbeak last winter. They are one of the life birds that I have been trying to get for years. With their erratic wandering though; finding them has not been easy. Since there were still postings on the ListServ; I decided to make seeing them a priority over the holiday weekend. Everytime I told someone I wanted to drive to the Catskills to try to see White-winged Crossbills, I would get the eye-roll. I don’t get it. It is not that far. Well, at least not from my house. So directions in hand, and a general idea of where I was going, I headed up alone into the mountains. It took me slightly over an hour to drive to the boreal bog where the Crossbills were being seen. Two women with straps adorning their bodies were intently scanning the tree tops as I pulled up. Anxiously, I stopped to ask if they were looking for the Crossbills. With nods and smiles they assured me that I was in the right place. Eileen and Ann Marie had driven all the way from Long Island to see them, again. Having been to see them several weeks earlier, they knew which trees they were frequenting. As we stood chatting, we listened and scanned the tops of the trees for movement. White-winged Crossbills are partial to trees with small cones like hemlock, larch and spruce. There, they were eating black spruce cones. We heard the trilling before we saw them. I first saw movement high in a tree across the road from where we were standing. The bird was backlit but I could see two distinctive flashes of white wing marks. We crossed over to get a better look. Ann Marie and Eileen got on it and said they saw red. Red. Two white wing marks. The bird was flitting and hopping at the top of a spruce. I kept losing him amongst the branches, but then he popped out into a sunlit window and sat. I could not have asked for better view. The camera, of course, was in the car. Eileen and Ann Marie are wonderful birders. Ladies, if you want to chase again. Let me know. 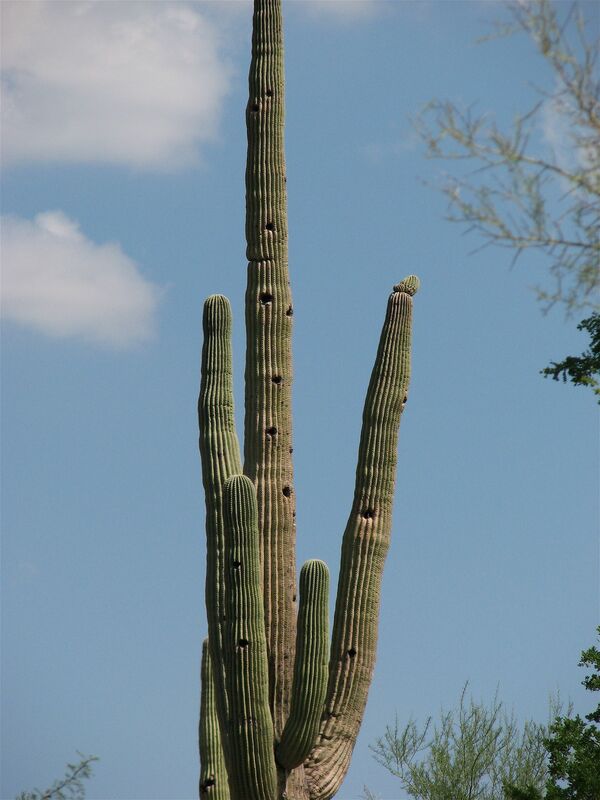 Beautiful high-rise condo available in the clean air of the high Sonoran Desert. Sturdy wooden frame with expandable water supply. Air-conditioned in summer and warm in winter. Isolated yet safe neighborhood. 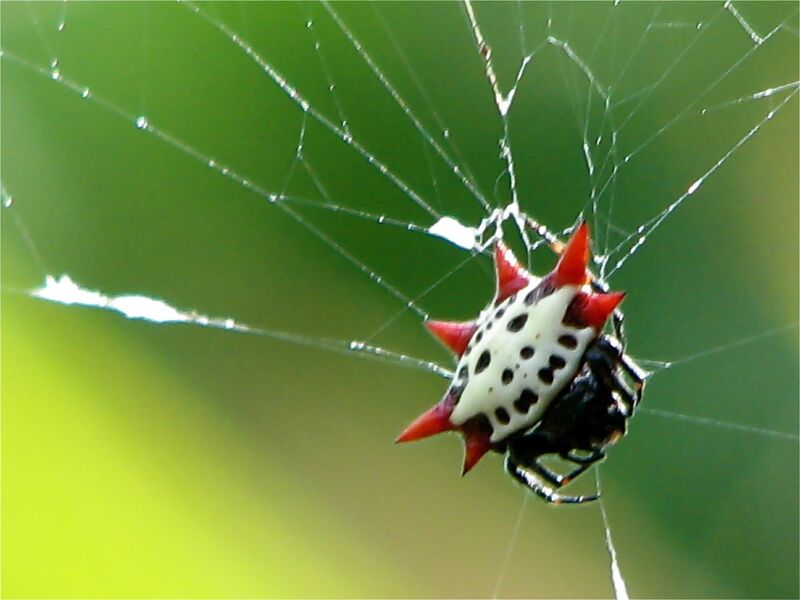 High security spines keep out unwanted visitors. You decorate to your specification. No down payment required. Move in condition. These vacancies won’t last. Quick put on lipstick, crows can tell us apart. Did you see the article in the New York Times about a study using masks for banding crows and the ruckus they put up after the fact? It is fascinating–go read it. Having heard stories of how wonderful birding was and then reading about the recent rarities being reported on the ListServ; when I saw the notice about the Jamaica Bay Shorebird Festival, I decided to go. I even convinced a few friends to go too. Never having been to the refuge, of course we got lost, arriving an hour late. Oy. After dashing in to get the trail permits, we found the small group of festival birders was just moving off to another location when we finally got to the East Pond. We birded East Pond as far around as we could, but since the water was pretty high in places; we didn’t follow the trail all the way around. (If you go, knee-high waterproof boots are key. We didn’t know.) There were small flocks of sandpipers, dowitchers and plovers frantically feeding along the water’s edge fluttering off as we approached to resume chowing down when we were past. Whole families of Mute Swans lounged trailside; no protective hissing and flapping like the ones on my lake. Terns plunged into the still green water and overhead a Peregrine Falcon folded its wings diving at an Osprey. As I watched a Gull-billed Tern wing past, a Blue-winged Teal came flying over my head to settle on the water at the end of the pond. (I just love ducks.) We crossed the street to bird the West Pond behind the Visitor’s Center too. In the end, we came away with 30 species. I got no life birds, but one of my friends did. She was happy. While I can see that it could be a very birdy location, it was not what I expected. I thought there would be loads of birds and birders. Not so. The participants were few and many of the birds had moved on. It was a better day at Brigantine and according to an email even the marsh by me was full of birds that day. Sigh. But that is how it goes. You just never know. That is the ups and downs of birding. Maybe the Meadowlands festival will be better. I do not often see swans flying. But when I do, it is a sight to behold. Thinking some kids had thrown an old bicycle inner tube up in a tree, I only gave it a passing glance until my friend yelled over, “Hey. What’s that in that tree? Is it a snake?” I looked away from a promising woodpecker hole to throw a glance in the direction they were looking. Huh! The things you see when you actually look. I walked over to them to contemplate the non-inner tube. 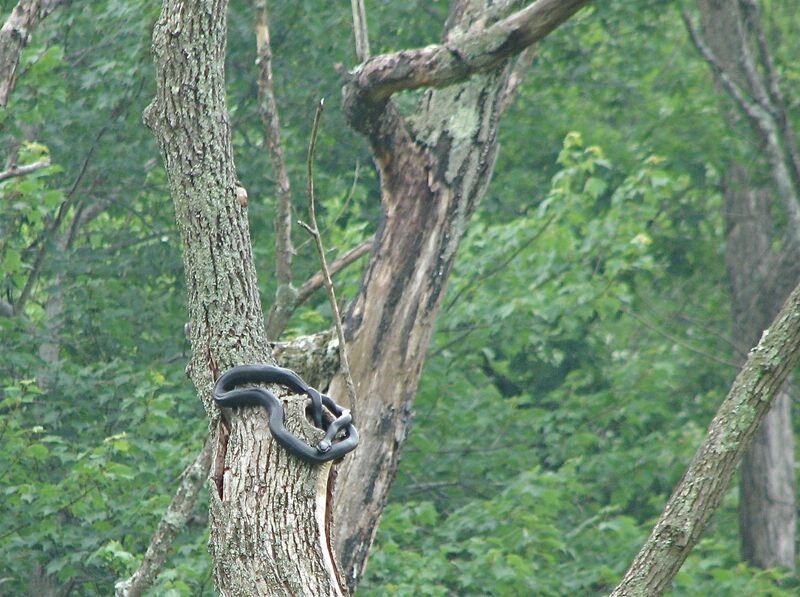 We decided it probably was a rat snake since they can climb trees and birds and eggs are some of the things they eat. It’s tail was still hanging in what appeared to be a large hole. What it was doing in a dead tree in the middle of a swamp is anybody’s guess. But it looked full and happy. Or at least satiated and not moving in the hazy sunlight.